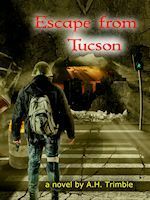 Last month I began (re)posting my online book Escape from Tucson. At first there were quite a few readers. Now it appears that there has been a significant drop-off. And I have had a couple of folks contact me saying they can’t the book on the website. So I need your input as to what other folks are experiencing. Please take the poll below. No poll link when viewing in Firefox ……………… Chrome shows the link just fine. Read it when you first posted it. I enjoyed it and found it informative as well. Keep it up. Tell me how .. link ? I read it when first posted. Kept a copy, and now rereading it as it is re posted. I’m seeing a lot more information in the pages this time than upon first reading….Looking forward to the rest of it, as well as Escape from Home. Ya missed one option. I don’t have time to sit and read a book. I listen to audio books.